Your 11-year-old self should get ready to get excited, because today we’re talking about a grilled cheese PB&J. No, we're not talking about smashing together Skippy and melted Kraft Singles (although that does sound...interesting). Chef Roger Waysok's version at Chicago’s South Water Kitchen is a lot more sophisticated than that. The "PB" in this case is pear and brie; the jelly, a blueberry jam. And the whole thing has the beautifully butter-crisped bread of every great grilled cheese. Chef Waysok envisioned the sandwich as a mash-up between two childhood favorites (although we certainly didn't have brie and blueberry jam in our lunchboxes). 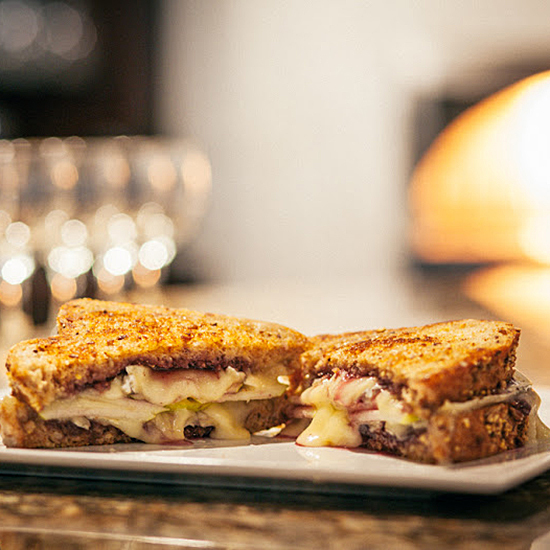 Either way, it's a tremendously satisfying, melty-oozy sandwich that has "winter comfort food" written all over it. The bread. Whole-wheat sandwich bread, which gets butter-griddled for maximum crisp. The filling. The brie may be the starring attraction here, but the thin pear slices and blueberry jam remind you, with perhaps a little childhood flashback, how great fruit in a sandwich can be.